Legal eagles have been pushing themselves to the limit to raise nearly £6000 for favourite charities. Three experts from Mackinnons Solicitors, which has offices in Cults and Aboyne, tackled gruelling individual challenges. One reached the top of the UK’s highest mountain, another ran the London Marathon, and one took on the Highland Cross coast-to-coast challenge. Sarah Polson, from the company’s dispute resolution department, Fiona Cheyne from the commercial and marine department, and Mackinnons’ partner Martin Sinclair, who is a specialist in personal injury law, raised a combined total of £5975 for three different charities. In June, Fiona Cheyne hiked up the 1,345 metre Ben Nevis with her mother Elizabeth Copp and raised £4610 for the PSP Association in recognition of the support the charity provides to her father Andy, who has been diagnosed with the rare and as yet incurable Corticobasal Degeneration (CBD). Earlier in the year, Mackinnons’ litigation associate Sarah Polson ran the London Marathon after receiving a ballot place. For the firm’s 175th anniversary she decided to fundraise for the Fishermen’s Mission, Mackinnons charity of the year. 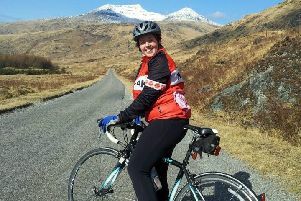 It is a 50-mile duathlon, 20 miles either running or walking and 30 miles by bike between Kintail and Beauly. Martin said: “The Highland Cross is a terrific event and I’ve been keen to take part for a while.